Hortus Camdenensis | Iris sambucina L.
This is a confused plant and probably a form of Iris lurida [Soland.] which see. Iris lurida is thought to be a hybrid, correctly called Iris x lurida Ait. Sambucina has flower stems to 60cm, usually branched, with violet-brown standards, often tinged yellow, and red or violet-brown falls, strongly veined, with orange or yellow beards. [RHSD]. 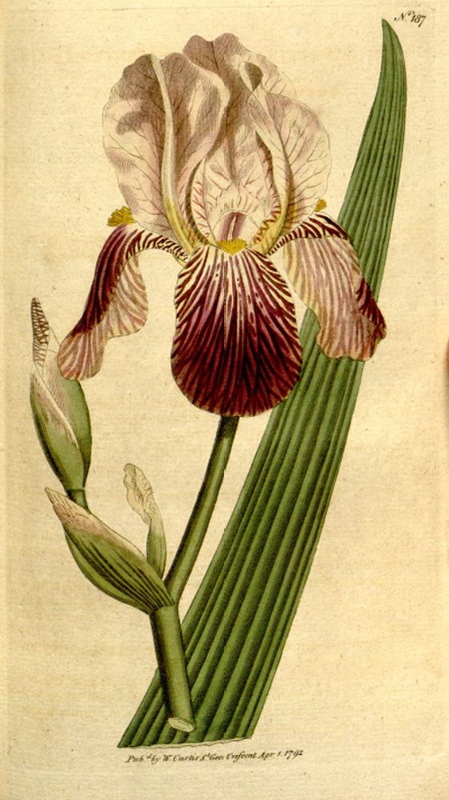 Johnson's Dictionary also lists an ‘Elder-scented Iris’ as I. sambucina, from southern Europe with blue flowers and introduced to Britain in 1658. Paxton's Dictionary gives a similar description. The Floricultural Cabinet describes it as similar to I. germanica, but darker in colour and smelling of elder flowers. [FC p.149/1859]. ‘This species of Iris, said to be a native of the south of Europe, derives its name from the smell of its flowers, which very much resembles that of elder in bloom. It is one of the tallest and handsomest of the genus, in a rich moist soil acquiring the height of three feet or more.’ [BM t.187/1792]. Listed in all published catalogues [B.252/1843]. For discussion of the nomenclature surrounding Iris sambucina and related plants see Iris lurida [Soland. ].